Web-based video interview provider grows market share, introduces mobile and remains a top video interviewing provider. Async Interview, a leading provider of video interviewing, released results and highlights showcasing a record-breaking year for the Philadelphia-based company. 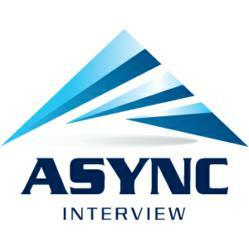 “Async Interview and the video interviewing industry, continues to see a significant growth pattern. Small and medium size businesses as well as Fortune 1000 are adopting video interviewing for its consistent process and financial benefits as an alternative to what can be a very inefficient recruiting process,” describes Christopher Young, Async Interview’s CEO. Live Video Interviewing Product Release: Early in 2012, Async added live video interviewing to its suite allowing employers to transition candidates from a pre-recorded to a live 1-on-1 or panel video interview. Sales Leader: Henrik Strame, Chief Sales Officer, joined Async Interview from Monster. He has over 19 years in sales and sales leadership, particularly in the HR space. Client Growth: In the 4th quarter of 2012, Async had client growth of 100%. Usage Growth: In 2012 Q4, Async experienced a 162% increase in number of interviews conducted versus 2012 Q3, while at the same time recording a 193% growth in user base versus the third quarter. Candidate Feedback: 48% of candidates stated that the biggest benefit of the pre-recorded video interview was being able to complete it at home followed by 23% which stated completing the interview at night or on a weekend was the biggest benefit. Mobile Introduction: Async recently released mobile compatibility allowing employers the ability to now view, rate and comment on video interviews via their iPhones, iPads, Android and Windows devices.